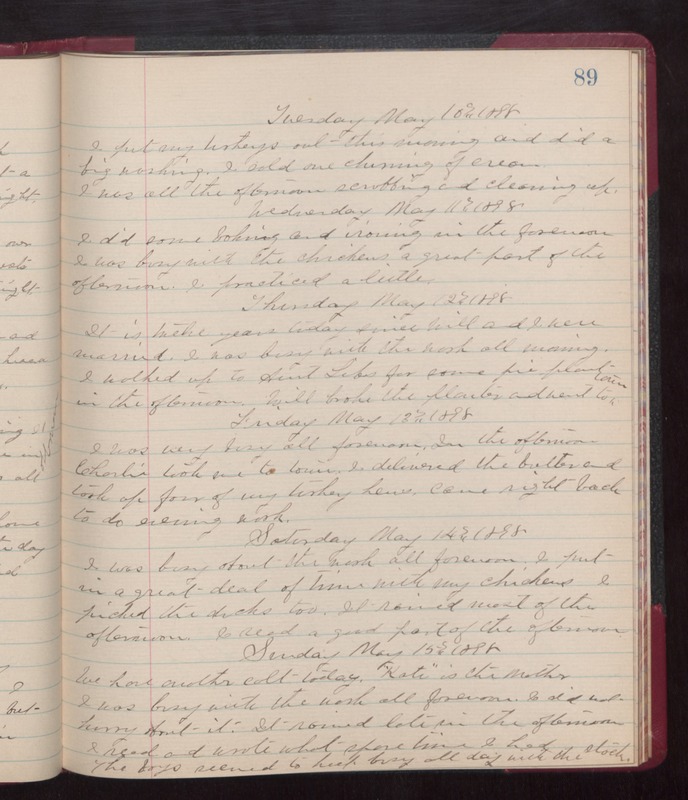 Tuesday May 10th 1898 I put my turkeys out this morning and did a big washing. I sold one churning of cream. I was all the afternoon scrubbing and cleaning up. Wednesday May 11th 1898 I did some baking and ironing in the forenoon. I was busy with the chickens a great part of the afternoon. I practiced a little. Thursday May 12th 1898 It is twelve years today since Will and I were married. I was busy with the wash all morning. I walked up to Aunt Libs for some pie plant in the afternoon. Will broke the planter and went to town. Friday May 13th 1898 I was very busy all forenoon. In the afternoon Charlie took me to town. I delivered the butter and took up four of my turkey hens. came right back to do evening work. Saturday May 14th 1898 I was busy about the work all forenoon. I put in a great deal of time with my chickens. I picked the ducks too. It rained most of the afternoon. I read a good part of the afternoon. Sunday May 15th 1898 We have another colt today. "Kate" is the mother. I was busy with the work all forenoon. I did not hurry about it. It rained late in the afternoon. I read and wrote what spare time I had. The boys seemed to keep busy all day with the stock.